For twenty-five years, Ellen Raskin's Newbery Medal-winning�The Westing Game�has been an enduring favorite and is now being reissued with a brand-new jacket by Kevin Hawkes and an introduction by Ann Durell. I don’t often read children’s books. I don’t consider YA to be children’s literature. This means I am not as well-read in a certain genre as I would like to be. Now when I say children’s lit, I don’t mean picture books. I mean the books that are in the juvenile section of the library between the picture books and the young adult books. Of course, when you are not well-read, you can take easy steps to fix the problem like, actually reading the books you haven’t read. When I want to correct something, I look for what has already been vetted as the best, which means looking up Newbery winners. 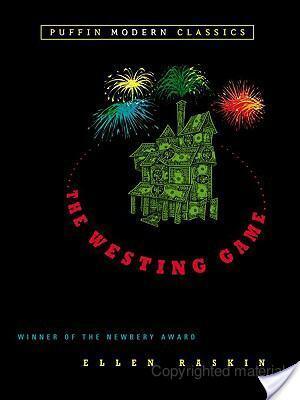 The Westing Game by Ellen Raskin was the 1979 Newbery recipient and had a premise that most definitely appealed to my sensibilities. I am sure you know the premise of Clue. If not, go to your nearest store and pick up the game. Fun will follow. Or pick up the DVD, it’s probably in the Wal Mart bargain bin, or at least the copy I have was. Well, the premise of the Westing Game is that a select group of people go to this mansion thinking they are heirs to the Westing Fortune. The twist though, is that one of the heirs is the murderer. *gasp* And no, I did not spoil that, it’s in like the first 10 pages. Therefore the heirs must piece together the clues to discover the murderer and emerge victorious and with money in hand. There are 16 players and consequently 16 suspects participating in The Westing Game by Ellen Raskin. You would think with so many characters it would be hard to distinguish them or they would fall into tired stereotypes. I actually found the players to be rather nuanced. Each is given a back history and a story. Their motivations are fascinating. I honestly really felt for the players, as we see what they struggle with. There was one character in particular in The Westing Game by Ellen Raskin�whom I really loved, Turtle Wexler. She was flawed and self-conscious. Her mother basically ignored her in favor of her perfect sister. Turtle hides behind her braid. Yet she is eccentric in that she is obsessed with stocks. I felt that Turtle was a fully realized character. And here’s the thing, I think children deserve characters who are fully realized, not second rate cardboard characters. What I really enjoyed about The Westing Game by Ellen Raskin is that I thought I had the culprit all figured out, cause you know I am an adult and clearly smarter than the intended audience, children. GUYZ, do not be arrogant like me. Children are actually smarter than we give credit for. Anyways, I was definitely wrong and Raskin pulled the wool over on me. I loved how clever the story was. Clever makes me happy. The ending, although it made me melancholy was perfect. I wish I had read The Westing Game�when I was younger. It’s one of those books that is both delightful and melancholy at the same time. I liked the realism, yet it also called for a suspension of disbelief. The Westing Game walks this line quite well. Perhaps you have felt the sting of first reading something in adulthood which should have been something you cherished during childhood. I am sad I came to this book late, but at least I have experienced it, and I guess that is enough. These in between books are called middle-grade novels, classified for 8-12 year olds, 9-13 year olds, or 10 and up (depends on the publisher). I was just thinking yesterday that I'd like to re-read this!